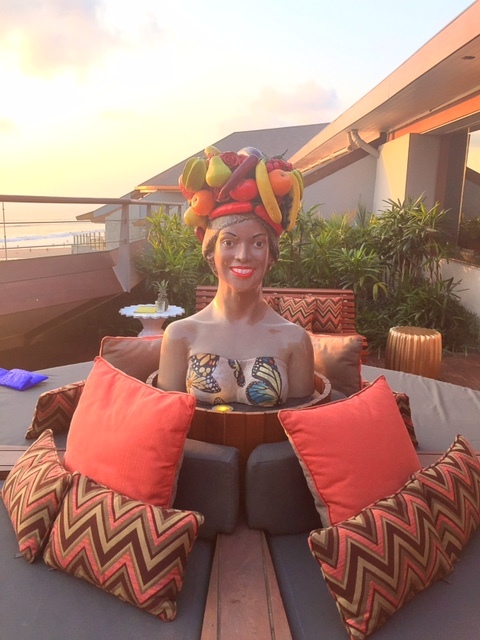 When I visited Bali last year with Mr SnS and our three boys, we had such a fab time. Such a fab time in fact, that at the end of that trip, I hatched a plan. 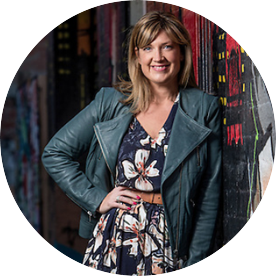 How fab would it be to return with girlfriends the following year as part of my Festival of Forty! I knew my girlfriends would love the fab food, excellent shopping, gorgeous places to relax and swim and that we could have an amazing time (with plenty of luxury) without spending a bomb. So, in March this year, we booked our trip – 6 days in Seminyak over the long November Cup weekend in Melbourne. Ash cloud aside (which we were extremely fortunate to escape on Cup Day as we quickly bought an airfare to Perth on an airline still flying when Jetstar had cancelled all flights including ours), we had such a fabulous time. I’m plotting my return although obviously we’ll be waiting for the recent volcanic events to end and I’ll be totally across my travel insurance too, just in case. So, if you’re planning a girls trip to Bali anytime, here are a few tips from my recent trip. In terms of accommodation, it’s worth finding somewhere central to stay so you can all come and go as you like without anyone having to spend long trips in a taxi alone. Our hotel (The Breezes Hotel) was centrally located a short walk from Seminyak beach and a short 5 minute drive/$2 cab fare to Seminyak Square (we always flagged down BlueBird taxis and asked for the meter – otherwise you could find yourself in a cab with an arbitrary minimum spend). There are loads of great villas around too which cater well for groups which sometimes come with chefs and recommended drivers. We opted for a hotel over a villa as there were only three of us and we wanted to be close to the action and have the convenience of restaurants, pool side drinks/food service and a swim up bar on site. We did not spend much time in our rooms though (they were basically just very comfortable beds, a balcony and two bathrooms in two regular hotel sized but well kept adjoining rooms) as we spent most of our time at the hotel poolside. If you prefer more living space, a villa would be a better bet. Our digs were also a short walk to one of the busiest shopping strips in Seminyak (the stretch where the Bintang supermarket is located) and had an ATM and a Convenience Store a couple of doors up where we stocked up on big bottles of water. Discuss how things will be paid for. You might decide to each pay cash as you go, or take turns at paying by card and work it out at the end. We took turns paying for dinners out, charged all our poolside drinks and food to our rooms and worked it out at the end to make sure we were all square. We also took turns paying for taxis which worked well for us. Before you get there, talk about what you want from the trip – mostly relaxing, shopping or partying – so you can factor in each other’s wants and needs. After all, it’s everyone’s holiday. If you’re close to the action, people can come and go as they like too. It’s also important to get a sense of each other’s budgets/priorities. 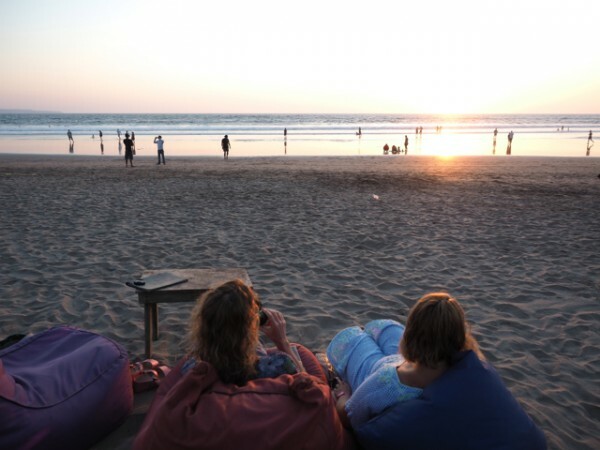 Ok, house keeping sorted, what sort of fun can you have on a girls’ trip in Bali? Plenty friends, plenty! 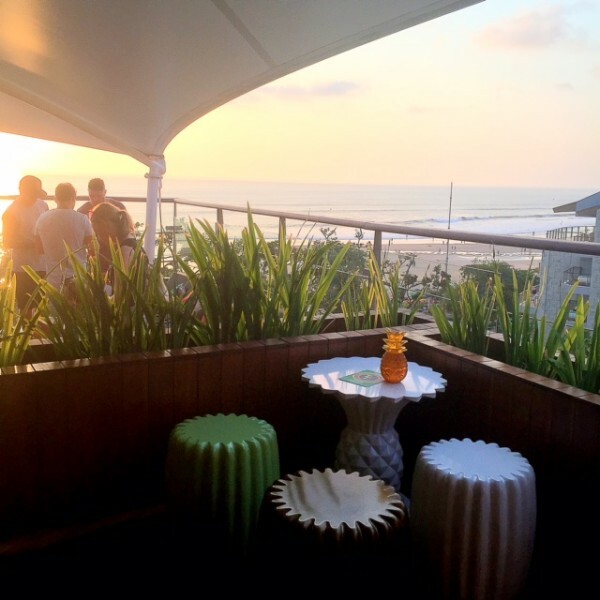 Rooftop bars are totally the thing in Seminyak. They are everywhere and a great way to watch the sun set with a cocktail in hand. 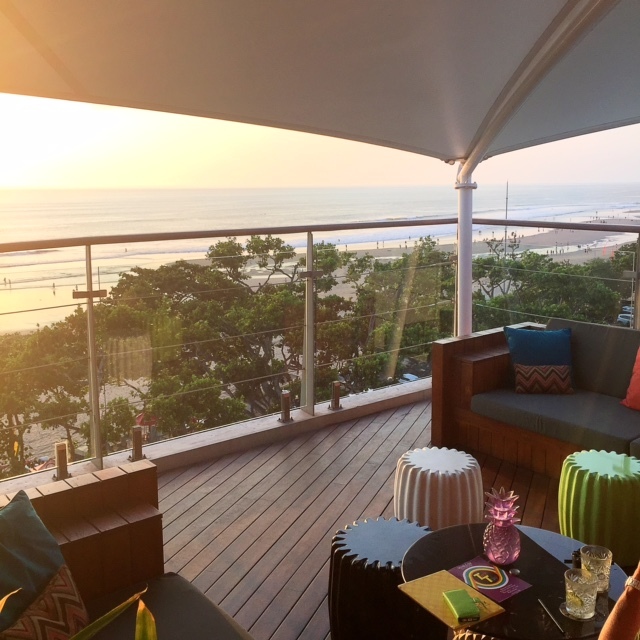 We LOVED the fabulous rooftop bar at the Double Six Luxury Hotel with it’s great beats, amazing fit out and spectacular views over Seminyak Beach. Most of the best viewing spots are reserved for pods though which you can book for groups provided you’re happy with a minimum spend. There was one area set aside for the general public though, pictured below, and loads of room inside. Once the sun sets, you can head inside to the bar area for a boogie, a look at the giant shark tank or even catch a movie – there’s a little movie area complete with deck chairs and a popcorn machine next to the bar. I know. Unbelievable. Check out the rooftop bars at Potato Head and The Corner House too. (More details of those and other fab places to eat in my Ten Great Places to Eat and Drink in Bali post). 2. Unwind with a Spa Treatment – in your villa or at a spa. Spa treatments are a great way to unwind, get into the holiday zone and better still, they are a surprisingly affordable treat in Bali. On one of my favourite days, we spent a few hours at Potato Head and popped in for a 1 hour massage at Bodyworks on the way back to the hotel (where we spent the rest of the day by the pool). What a great day of indulgence. 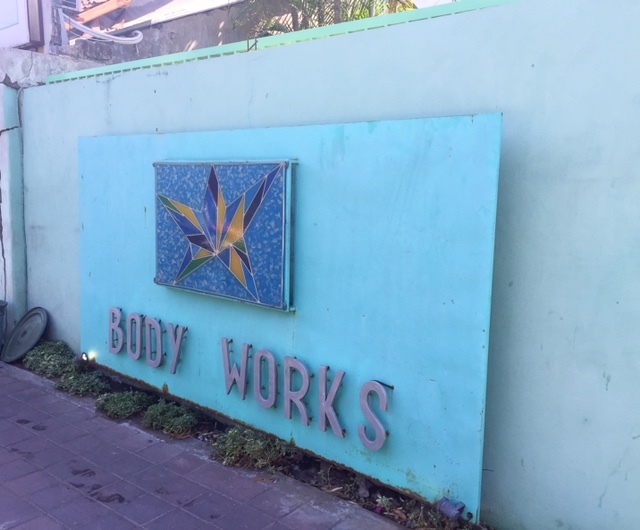 You can book ahead at Bodyworks either in person, online or just rock up. The place is humming with five girls on the front desk with their giant appointment books. You can have everything done here – from a blow wave through to a mani and a pedi – sometimes simultaneously. 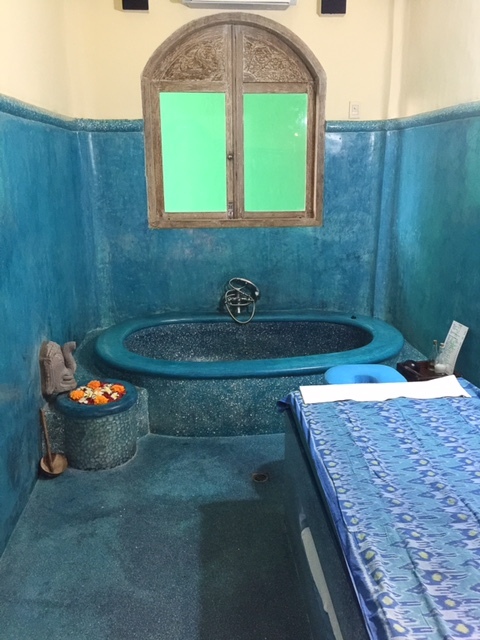 We all rated our massages highly but if you finish with a frangipani bath like I did, you’ll lose ten minutes of massage time. I was cool with this but one of the girls opted for a shower instead to extend hands on time. We all agreed our treatments were sublime. Another day, the girls walked up the street and found several spas on the main drag. They ended up having another excellent 1 hour massage each for $8, which was much less than Body Works. Many villas and even hotels offer in room services too. 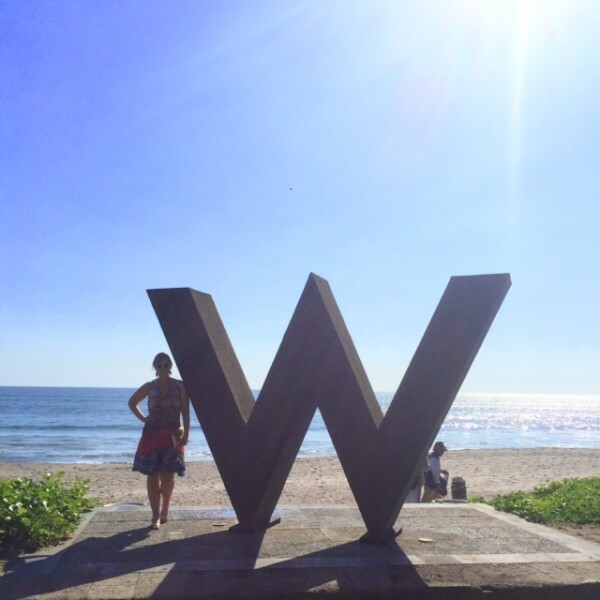 There are so many excellent places to eat in Seminyak. My favourites are Sarong, The Plantation Grill, Mama San or Sardine – you can read my reviews of them here. 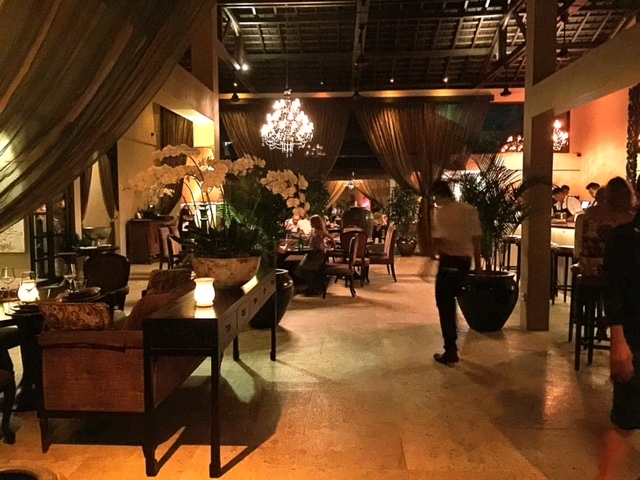 My favourite meals this trip were Sarong, above, and the Gatsby inspired and unbelievably fabulous and glam Robert Marchetti’s Plantation Grill at the Double Six Luxury Hotel, below. 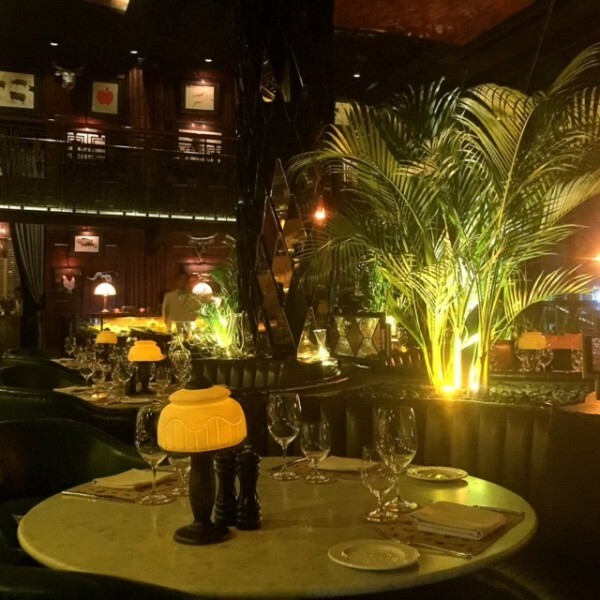 Live jazz, attentive waiters and fabulous food making for a rather fab night out. 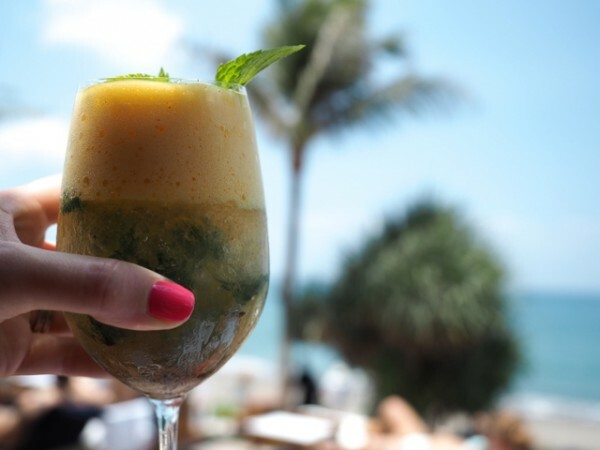 Make sure you book ahead (book Sarong here and The Plantation Grill here) and remember to go through the tedious re-confirmation process – you’ll need to re-confirm bookings at most places twelve hours before so check your phone/email or you may lose your booking. It’s also worth booking Sarong a couple of weeks before you leave unless you’re flexible with what time/day you want to visit. I really can’t go past the Sunday lunch at The W Hotel’s Starfish Bloo. The food is fab (especially if you love your seafood), the atmosphere divine (beats and views) and the service attentive. This is such a great spot and there are packages to suit budgets and tastes but make sure you book ahead. Just a hot tip – when I booked online from home, I was asked to provide my credit card details and a copy of my ID to secure the booking, which I was not prepared to do. Instead, I emailed and asked if I could ring through with my credit card details (needed to secure the booking unfortunately) from my hotel once I arrived in Bali (several days before our lunch), which I did and it all was all fine. 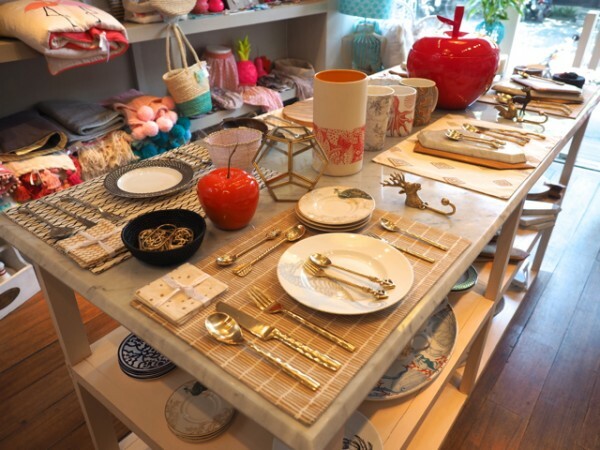 I was super impressed by the shopping in Seminyak when I visited last year, all of which I documented in great detail in this Where to Shop in Bali post along with some suggested itineraries – I’ve just updated it too. There are some great clothing, accessories and home wares stores as well as the markets. I’m a bit embarrassed to admit that I didn’t make it to the beach last visit. Sure I saw it from a distance (on the day bed at Potato Head or from Starfish Bloo during lunch counts, right?) but I didn’t feel the sand between my toes. It turns out that the beach was at the end of our street and was a great way to get some space after spending a lot of time in the built up, touristy areas of Seminyak. Sure it’s busy on the beach with loads of people, vendors and cafes but there is still that sense of space and freedom. It was pretty hot with the sun beating down though so we generally walked along the beach early morning or at sunset, where we sat and watched while the sun went down. Most of us really need some downtime on holiday which can be a challenge when you want to do and see all the things. I’m really glad that one of my girlfriends was great at prioritising pool time which meant we had hours each day to just rest, swim and read by the pool. We still did heaps but we all felt so well rested at the end of our trip, which is what we needed as we were all hitting the ground running. 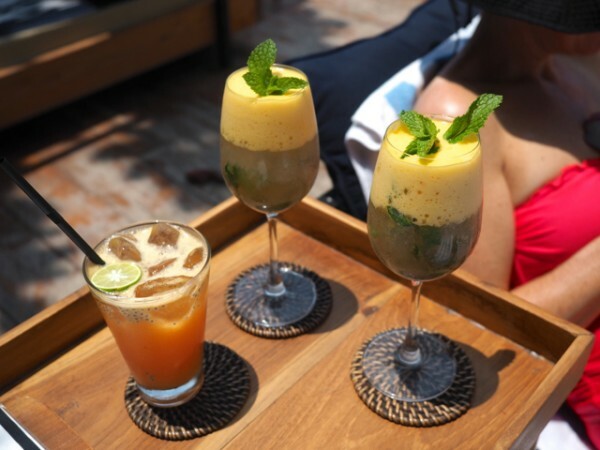 So, make sure you include plenty of pool side chillaxing during your stay either at your resort or villa or, for change of scenery a beach club like Potato Head, below. 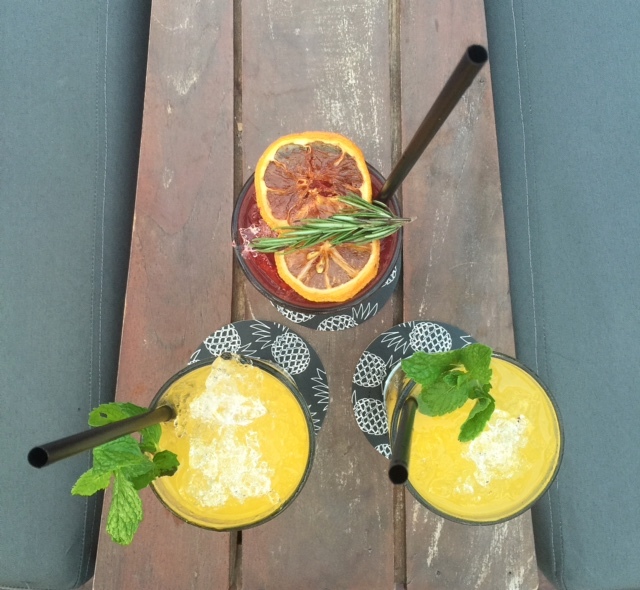 And if you do visit Potato Head, do yourself a favour and have a Kookaburra or three like we did. No words people, no words! Finally, this might be overkill, but if it helps with planning, I thought some readers might be interested in our itinerary and how we managed to fit all of this in and, in particular, how we struck the balance between doing and seeing a lot and getting plenty of chillaxing time. Here’s the rough guide. Day 1 – Arrive mid arvo and head to Sisterfields for lunch. Have a quick wander before heading back to the hotel for a swim, dinner and cocktails by the pool and an early night. Day 2 – Shopping in and around Seminyak Square with coffee/juice breaks at The Corner House and Sisterfields for the morning. Lunch at Motel Mexicola. Back to the hotel for poolside chillaxing for the arvo. 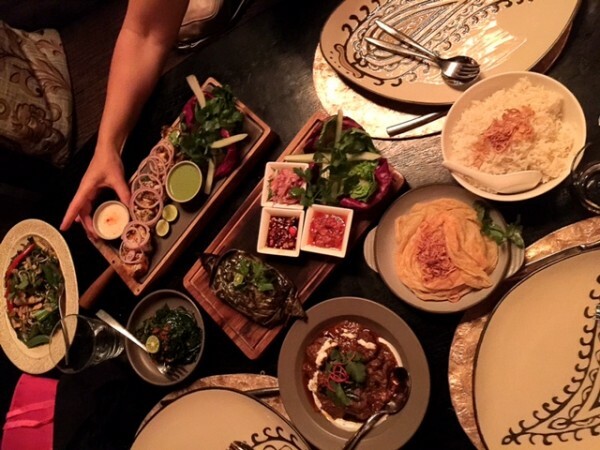 Dinner at Sarong. Day 3 – Potato Head for a few hours (opens at 11am, free entry and you’ll need to get there before opening to secure a day bed which comes with a minimum food/beverage spend), massages/treatments at Body Works early arvo and then back to the hotel pool for a few hours before dinner at Mama San. Day 4 – Shopping in the morning – hours spent at the Seminyak Square market, Mist, Mister Zimi and E-Biza (all covered in my Where to Shop in Bali post). Lunch at Sea Circus. Back to the hotel for pool time. 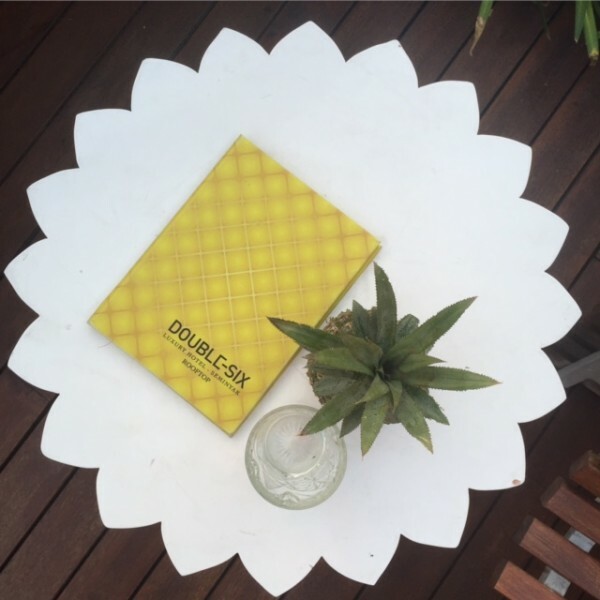 Head to Double Six’s rooftop bar for Sunset (cocktails) then on to The Plantation Grill (on the same floor) for dinner. 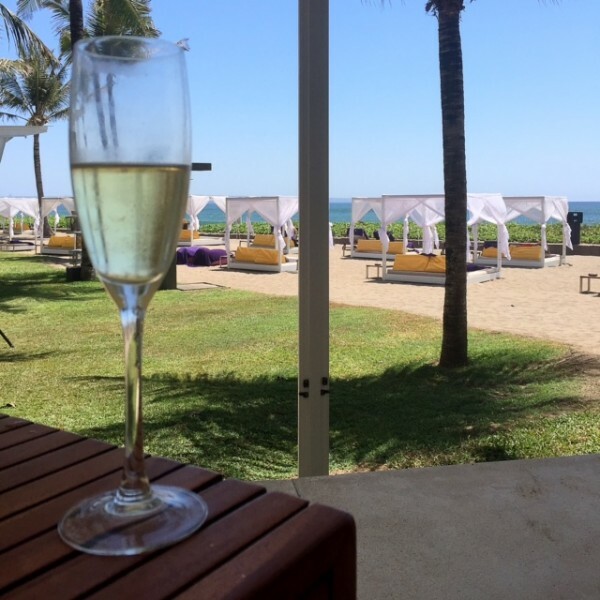 Day 5 – Walk along the beach, juice stop at Sea Circus before hitting up Oberoi market. Back to the hotel to get ready for our lunch at Starfish Bloo (only on Sundays, from 12 – 3.30pm). Back to the hotel pool. Late and light dinner in the hotel. 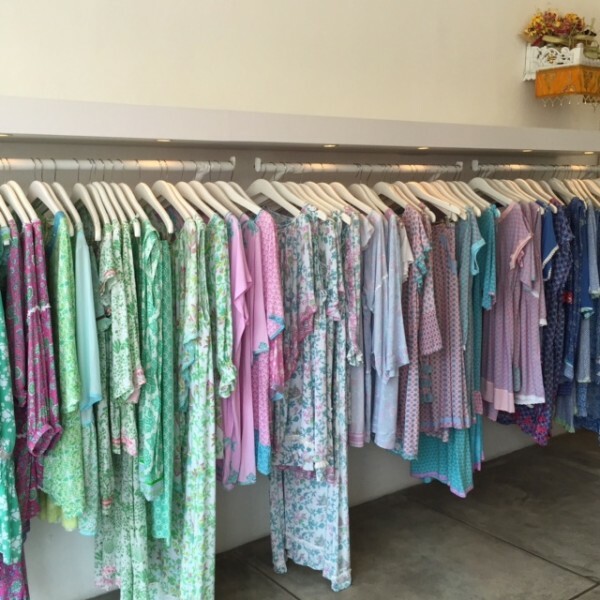 Day 6 – Shopping in and around Seminyak for the morning, lunch at Sisterfields, back to the hotel for pool time all afternoon. 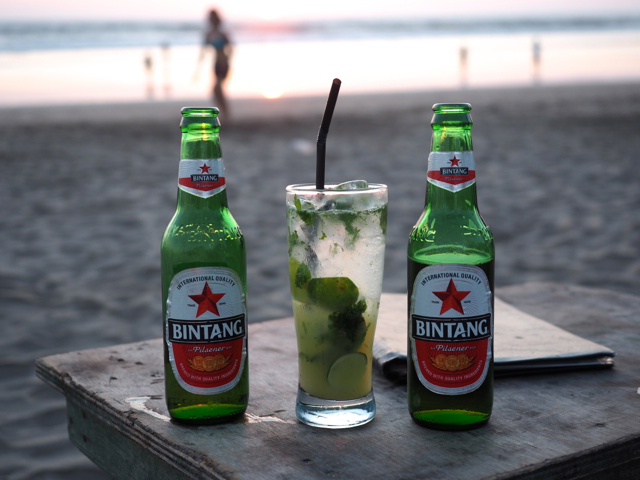 Walk down to Seminyak beach for sunset and a cocktail/Bintang before dinner at Chez Gado Gado overlooking the beach. 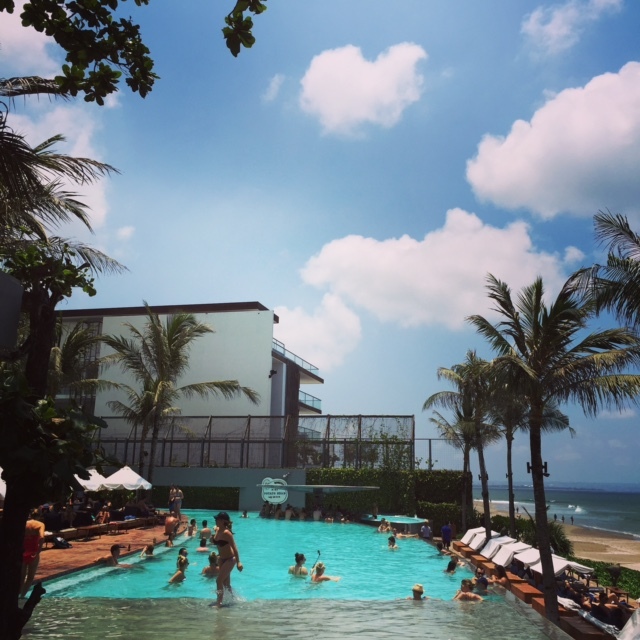 Day 7 – Pack, quick trip in to Seminyak for last minute buys and a last juice at Sisterfields. Back to the hotel to finish packing, pay hotel bill and for transfer to the airport. You can see pics of what we did by checking out my Instagram feed. If we’d had another day or two, we would have taken a trip to Uluwatu for the Rock Bar or spent a day at Water Bom park in Kuta for a bit of fun! 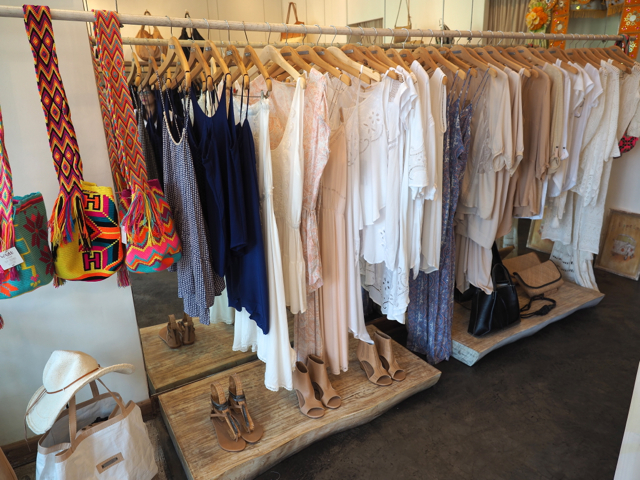 Stay tuned for next week’s post What to Pack for Bali (or another tropical destination). 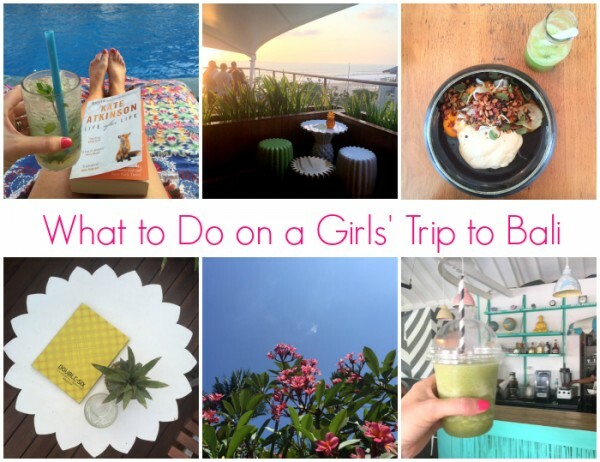 Have you been on a girls’ trip to Bali? Or somewhere else? What did you do and what do you wish you did more or less of?